Health Clubs, Fitness Centers, Gyms are gaining more efficacy in providing promising results to its customer. Though number are services offered by Health Clubs increase day by day and so the number of competitors, there arises a question among everyone regarding the niche they have for the service quality. Customers choose health club based on their service quality. Thus, it is a high time to understand and analyze the customer’s perception, their expectations and unveil some extremely valuable information to support the study of service quality management priorities at health clubs. 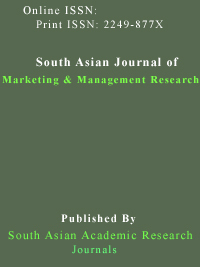 In this study, a sample size of 111 has been taken from Chennai area and research has been conducted by a structured questionnaire and various analyses like data analysis, statistical analysis using chi – square tests have been resulted and the service quality measurement has been narrowed with suggestions for betterment of service quality that results in business development. A. Rajathi and P. Chandran, SPSS for you, MJP Publishers, Chennai, 2010. David George and Paul Mallery, SPSS for windows, Step by step- A simple guide reference, 2008. Deepak Chawla and Neena Sondhi, Research Methodology: Concepts and Cases, Vikas Publishing House, New Delhi. Fan Chun Man, 2010. Differences on customer service satisfaction of the fitness clubs between China & Hong Kong. Krinanthi, 2011. Psychological Constraints in academic sports and service quality. Nguyen Le Huyen, 2011. Customer Satisfaction Survey for Actilife Fitness Center – Kokkola. Pairot Rueangthanakiet. 2008. Member‟s Satisfaction of Fitness Service Quality: A Case Study of California Wow Xperience Public Company Limited. Philip Kotler and Kevin Lane, Marketing Management, PHI Learning / Pearson Education 13th Edition, 2008. Uma Sekaran, Research methods for Business, Wiley India, New Delhi, 2006.